HONG KONG — For Chinese banks, the decision to lend to companies like Bohai Steel was for years a no-brainer. Lenders took heart from its state backing, which appeared as solid as the millions of tons of steel pipes that rolled off its production lines each year. That ironclad image is now tarnished. Plunging demand and a worsening glut in production capacity have left Bohai Steel struggling to repay as much as $30 billion in debt. Worried creditors — more than 100 of them — are locked in negotiations with the company and local officials. China’s bad loans are on the rise, as companies that borrowed heavily in headier times struggle against a slowing Chinese economy. Underscoring the slowdown, China said on Friday that growth in the first three months of this year fell to 6.7 percent, a seven-year low. Growth might have been even slower, had China not revved up lending during the quarter — a solution that could add to debt problems later on. The stakes are high for banks and for the Communist Party, which ultimately controls wide swaths of China’s economy. China’s total local currency loans have more than tripled since the start of 2009, to 98.6 trillion renminbi, or about $15 trillion, at the end of March, according to official Chinese figures from CEIC, a data provider. That is equal to 144 percent of China’s gross domestic product in the 12 months to the end of March — relatively high for China’s level of development, and still rising. In January, Goldman Sachs said other countries that experienced similar debt run-ups faced either financial crises or prolonged slowdowns. Defaults tend not to pose a risk to individual Chinese banks because the government is perceived as standing behind them. But a chain of defaults could lead to a pullback in lending that could crimp China’s economic output, said Anne Stevenson-Yang, a co-founder of J Capital Research. Profit growth at China’s biggest state-owned banks stalled in the first three months of the years as bad loans mounted. Bad loans as a share of their total portfolio remains low, at less than 2.5 percent, but economists believe the figure understates the problem because banks often extend the payment dates for problem debt. Bohai Steel has not disclosed details of its debt, and it is unclear which banks might be affected. But it regularly did business with China’s biggest state-run banks, as well as local and regional banking groups also tied to the state. 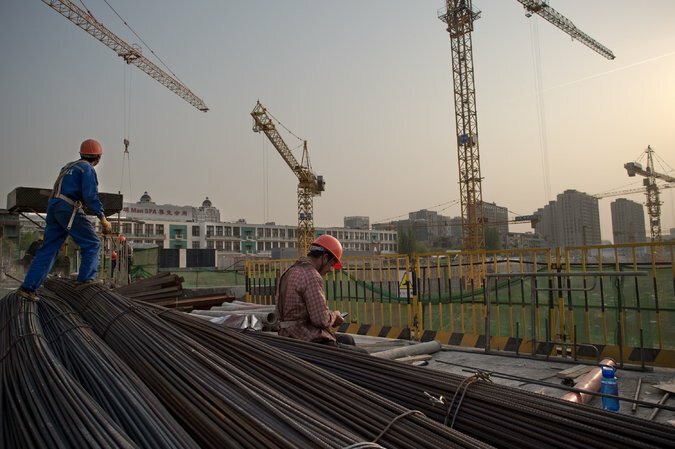 Since the beginning of this year, company executives have lobbied for more support from banks, as slowing growth and a property slump have reduced China’s demand for steel. In January it met with officials from China Bohai Bank, a lender that like Bohai Steel counts the city of Tianjin as a major shareholder. At the meeting, according to a statement from Bohai Steel, Yan Zesheng, general manager of Bohai Steel Group, said he hoped the bank would “continue to offer robust financial support” to the company. Over the years, the company stressed its ties to lenders including the Bank of China, Industrial Bank and Citic Bank, among others, according to statements on its website. In 2013, the company said, it received a roughly $4.6 billion line of credit from Bank of China. A recent article in Caixin, a respected Chinese financial news outlet, said Bohai Steel’s 105 creditors included at least three local banks in Tianjin and Beijing that were each owed more than 10 billion renminbi. en the end of 2014 and September of 2015, the most recent data available. It cited the Chinese economy and problems in the steel industry. Neither Bohai Steel nor the banks responded to requests for comment. “Economically, it’s really hard to get the company back to life, but politically the government needs to support it,” Mr. Xu added. Other recent examples of corporate defaults in China offer, perhaps, less room for confidence. Dongbei Special Steel Group, based in the northeastern port city of Dalian, has defaulted on its bonds multiple times since its chairman, Yang Hua, was found hanged in his home last month. China Railway Materials, a supplier of construction materials to the railroad industry, became one of the first companies that is directly owned by the central government to run into debt trouble. The company suspended trading this month on more than $2 billion worth of bonds and said it would seek to restructure its debt. For China’s banking system, the coming months are almost certain to bring more defaults, bankruptcies and other debt problems, according to economists. “The low default rates that we have seen in recent years are perhaps too good to be true,” said Tao Wang, the co-head of Asia Economics at UBS. “The rise is natural considering the economic circumstances,” Ms. Wang said. The Bohai Steel case also demonstrates how China’s mountains of corporate debt extend beyond just traditional bank loans. One of the company’s main subsidiaries, Tianjin Steel, also sought to raise money from ordinary investors. Tianjin Steel sought to raise as much as $100 million in investments known in China as trust products, according to a review of the marketing materials for those investments. Trust products, which are often used by industries that have a hard time getting funding, are lightly regulated and difficult to track. National Trust, a trust company that issued some of these investment products on behalf of the steel maker, has said that some of the products have run into problems.